Manager Gary Locke insists Hearts can "bounce straight back" after their relegation from the Scottish Premiership was confirmed. Hearts beat Partick Thistle but needed St Mirren to lose the game the Buddies went on to win against Motherwell. Now Hearts face the prospect of Championship football against Rangers among others next season. 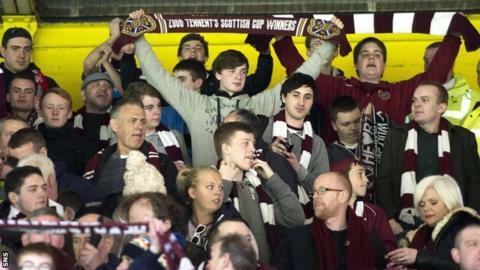 And Locke described Monday's meeting of the Tynecastle club's creditors as "the biggest day in the club's history". UBIG and Ukio Bankas, who are also undergoing insolvency procedures, will meet with their creditors and Hearts are hoping a deal to transfer shares in the club to proposed buyers the Foundation of Hearts will be ratified. Administrators BDO only have enough money to keep the club running until the end of April, as they bid to stave off liquidation. "Everyone connected with the football club is just desperately praying that everything goes well," Locke told BBC Radio Scotland. "I'll have the phone sitting beside me all day. It's not a day I'm looking forward to but if we can get a positive outcome, we'll certainly be happy people come Monday night. "I'm really positive that we'll get this deal done then Heart of Midlothian will be back where we belong and that's at the top end of the SPFL." Of the 4-2 defeat of Thistle, Locke reflected: "I thought we were outstanding, apart from the first 15 minutes when we lost a sloppy goal. "After that, I thought it was probably our best performance of the season. "I wasn't really interested in what was happening [between St Mirren and Motherwell] until a couple of minutes to go. "So, we're disappointed, really disappointed; but with the backing we've got at this football club from our supporters, we're certainly aiming to bounce back. "All the players have improved. Hopefully it'll stand us in good stead for the future." And the manager paid tribute to the Hearts fans. "Thanks, on behalf of myself and the backroom team and the players," he said to the supporters. "The support that we've had from them throughout the course of the season has been nothing short of remarkable. "There's not many football clubs in world football with fans that would do the stuff that our fans have done for this football club, in terms of dipping into their pockets all the time. "We're constantly asking them for money and they keep delivering the goods."